This world has gone crazy mad and sometimes it seems as ludicrous as swimming up Niagara Falls to think anything we do is going to change anything. It's true that we can't fix it. This broken place won't be made right until the One Who created it comes back to deal with the mess. Wasn't there some kind of chaos then, back when the Spirit hovered over it all, and then He spoke "Let there be..." and all this beauty was? Then we went and messed it all up again, and sometimes the mess we've made is so overwhelming that it's tempting to just hide my head in the sand until the Second Coming. And then I remember how we CAN make a difference for the one. Like the baby girl with the sunshine smile, who's birth mama asked us to "babysit" her, and who knew our yes would change her life forever and our life forever. I remember the day when the judge declared her our granddaughter, legally and forever. There's the kid with a home life so messed up it seems like a bad t.v. movie, and now she, he, (there are so many that fit that description), are grown women/men and they love Jesus and are leaders in His church, but oh the years and the tears and the frustration of pulling them out of the pit, not just once or twice but over and over and over 'til they finally got their feet planted firmly on the Solid Rock. When we went to Ghana, I had to put a wall of protection around my heart, the needs were so overwhelming and in your face, so much more than my emotions could handle. That, "how in the world could we ever make a difference" feeling was overwhelming times 10, times 100. January, a team from our church will be back in January. We're going to dig a deep water well in your village, with an irrigation system, so your village can grow crops year round, not just in the rainy season. 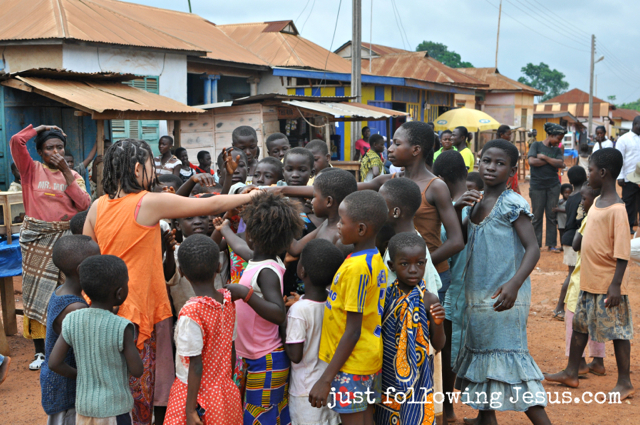 We've raised half the money needed, but we're determined, with God's help, to make a difference for one Ghanian village. One person, one village...sometimes you just have to do what you can do. 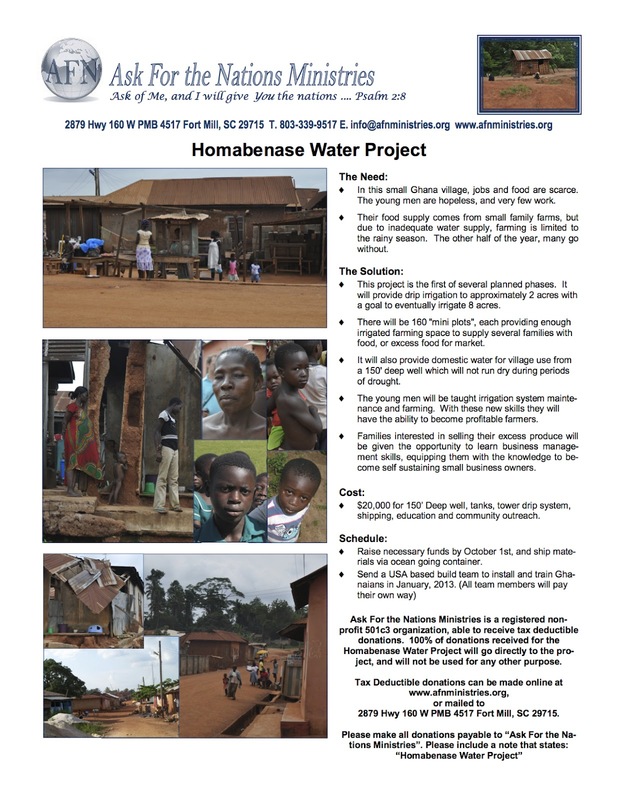 Read more about the well project for Homabenase, Ghana, West Africa here. If you are interested in giving to the well project you can give via the paypal account under missions on my sidebar. If you have a blog, etsy shop or online business that you want to advertise, you can buy a space on my sidebar for only $45 for three months. One hundred percent of those proceeds will go to the well project. I love this. Mother Theresa said, "If you can't feed 100 children, then just feed one." Sometimes I think despair or apathy set in when the task and needs seems so overwhelming and our contribution is but a drop in a bucket filled with holes but God makes a way. We just need to be obedient. thanks so much for sharing. We're neighbors at God-Bumps today and I count it a sheer gift of grace to bump into you here... your words spur me on in a time when I feel overwhelmed with all the needs of the world- at large and right in my own little home. And here, you speak hope... just follow one step at a time. Who knows how are small offerings grow large by His hand? Blessings to you. When I read your blog it really touched my heart. I do not have a lot to give but if everyone would just give a little bit it could really go a long way toward helping these people. Thank you for sharing this story. Taking this away from your writing, "Sometimes on the days you can't help it's great to look forward to helping." I had something else to say, but then I happened to read the comment right above mine. I love what she said about looking forward to helping. Because of the wonder that God has done in our lives and family, I can look forward with even more confidence. I also loved how you reminded us exactly how it is that we change the world for Him and through Him and in His name. We do it the way it has always been done: One story at a time. I'm so glad to be able to visit more regularly. I have never come here without living inspired. If it isn't a vignette or other inspiration for my home, it's an inspiration of my spirit. The second kind is my favorite. oh yes, to all of this. loving people up close, one or two at a time, fills them up to offer someone else healing. and the whole thing spins into a beautiful web of redemption, centered on Jesus. "...but oh the years and the tears and the frustration of pulling them out of the pit, not just once or twice but over and over and over 'til they finally got their feet planted firmly on the Solid Rock." These words locked around me tonight, humbled and reminded me about the journey we're about to take with our adopted son, a 15-year-old boy having been through the ringer of life, through the mess of it all, who needs the Acts kind of miracle himself. But this redemption, this what-can-come-out-of-the-dust is worth keeping an eye on, and I thank you for filling me up with that tonight. Blessings to you.